Great Summer – Busy Fall! First and foremost I would like to welcome our new medical students and residents. The new academic year is always refreshing, and I have always been especially energized by the excitement and enthusiasm of first-year students and residents. This year, I had an opportunity to speak to our new Aboriginal students as well as the whole class of 2020. All had a wonderful welcome to the college and the Aboriginal students heard from Michif Elder Norman Fleury and First Nations Elder Louise Halfe about connection with their community. As I have just come back from my 35th medical school reunion, I emphasized to the whole class what a wonderful journey they were on with the classmates around them and the important role they will play as clinicians, leaders and team players in the future Saskatchewan healthcare system. In that regard I was really pleased to see today’s headline in the Star Phoenix: Next decade could see the rise of homegrown Sask doctors and the great interview with Dr. Joanne Siverston, alumnus, Prince Albert physician and SMA Vice-President. I also reminded the students that the Olympics come around quickly and, despite the hard work in front of them, when the Japan summer Olympics open they will have been residents for a month! And I pointed out that all of us at the College of Medicine and our healthcare partners are here to see them succeed. I hope you all have had a great summer of rest and renewal. I certainly did. 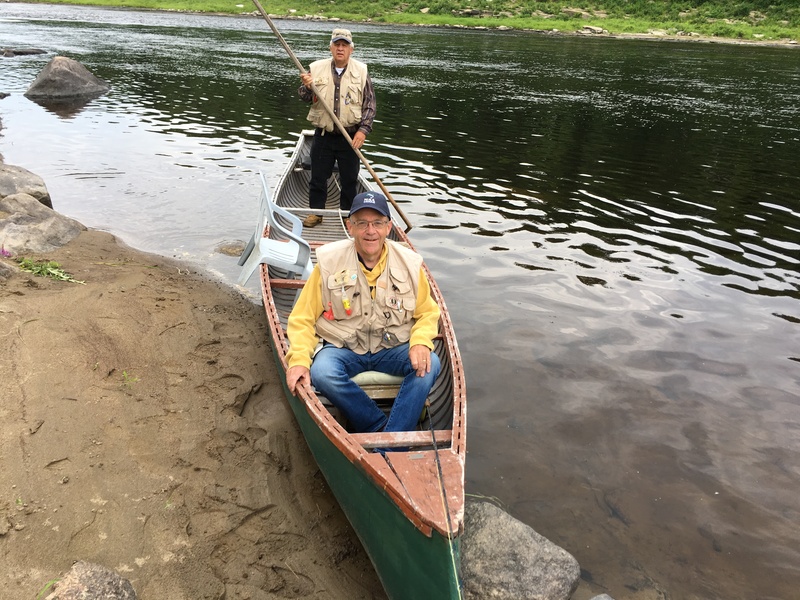 It started with a northern Saskatchewan fishing trip with Dr. Keith Ogle, our vice-dean faculty engagement, which included flying in to his lake on a DeHavilland Beaver (built before I was born) and a fabulous and highly successful introduction to fishing Northern Pike. The medical school reunion back in the Maritimes was an excellent opportunity to reconnect with some wonderful friends, including a class mate I discovered I could now keep up with who was easily the best runner in our class! Around the reunion, we packed in visits with family and friends, Atlantic salmon fishing on the Miramichi and time at beach-side resorts in PEI and NS. It was a great summer. And now we embark on an incredibly ambitious and important fall. As you know, much of the work of the last two years has been implementation of The Way Forward, leadership recruitment and faculty restructuring. This fall, we will complete a college-wide strategic planning process. We all know we want a highly successful College of Medicine, but what does that look like? What are our strengths? What are our priorities in education, research and community service? Your engagement is essential, and you will be hearing much more about this project. You may have received an invitation to our accreditation launch event. A full UGME accreditation visit takes place at the end of October 2017. Like the silent phase of a fundraising campaign, many faculty and staff led by Dr. Athena McConnell (Assistant Dean Quality) and Kevin Siebert (Accreditation Specialist) have already been working very hard. The launch is an opportunity for all of you to get engaged in our accreditation preparation. As you have heard me say many times, accreditation is a team sport. The College of Medicine can only succeed in putting accreditation challenges behind us if all of you are involved. I hope you can come out to one of our launch celebrations on September 12 at our Regina and Saskatoon campuses. We are still working on scheduling an event in Prince Albert. The team working on restructuring our biomedical science department and developing new undergraduate biomedical science programs based in the CoM will make important progress this fall. Substantial development of our “one faculty” model is underway and will lead to one pathway for appointment and promotion of MD faculty. Following on last year’s successful College of Medicine and research awards (COMRAD), we will place increasing emphasis on research. In that regard, Dr. Marek Radomski has initiated an external review of our research programs and we will be visited by five internationally renowned medical researchers from October 30 to November 1, 2016. Their review and recommendations will be an important step in the advancement of our research agenda and will inform our strategic plan. And speaking of research, congratulations to Dr. Deb Morgan on the $2.3 million Foundation Grant from the Canadian Institutes of Health Research that will fund research over seven years to improve dementia care resources for rural healthcare providers. This is very important work; it’s estimated that 47 million people in the world live with dementia. So when asked, “What is going on at the College of Medicine?” my answer is: accreditation, accreditation, accreditation, strategic planning, biomedical science renewal, one faculty, research, research, and accreditation!! Did I mention accreditation? Seriously, accreditation is simply superb medical education and research in the context of a great clinical setting. And we will demonstrate that to our peers with the 2017 accreditation visit. All of the work and plans above are important, as are many other college initiatives (Aboriginal health, social accountability, simulation, Inter-professional Educational Initiatives, and more). I thank you for all of your hard work to date and look forward to your support, advice and engagement as we embark on this ambitious fall agenda. As always, I invite your feedback. I trust you are having a wonderful summer so far and have had, are having or will soon have some holidays complete with time to rest and rejuvenate. I have just returned to work this week after an amazing break and feel ready once again to take on the incredible opportunities and important challenges of our College of Medicine. I always am excited to see September come around to launch a new academic year and I look forward to all of us coming back together from the summer with renewed energy and fresh perspectives. The reason this is so important this year is the CoM is embarking immediately—at the end of this month—on a college-wide strategic planning process in which all members of our community have a voice, should you choose to share it. I strongly encourage you to do so. Why? Because everything we have been through in recent years, which has been difficult and at times even painful, has helped set the stage for our college, now, to move forward in the best possible way. I am looking for a shared commitment to doing this work together. With all of our community’s individual voices coming together to create a pool of knowledge and experience of the CoM, we have our best shot at creating a plan that will reflect the diversity of our work, needs and aspirations at a grassroots level—to ultimately elevate our students’ experience, our teaching excellence, and the reach and impact of our research. The strategic plan development process will follow a rapid timeline – we plan to have the full college consultation and information gathering process completed between the end of this month and the end of this year. That’s just four months to gather a vast array of detail, input and knowledge from a large group—all of our faculty, staff and students. Accreditation requirements necessitate this timeline, but we will work to engage with you in this timeframe through a range of methods for you to share your perspectives and suggestions: focus groups, online surveys and other discussions and meetings. At a high level, the next four months will look like this: during September, two task groups will cover the areas of teaching and learning, research and innovation, as well as separate engagement forums to review and discuss clinical care service and community engagement, governance and partnership, and administration. If you are interested in participating in any of these discussions please let us know. In October and November, these task groups will lead engagement forums for your participation, including visioning and prioritization events, focus groups, and so on. Ultimately, we will arrive at a draft plan early in 2017 that will need to be ratified by the College of Medicine Faculty Council. The outcome of this work will be a new vision, mission, values and priorities for the CoM. At that stage, there will also be tremendous opportunity (and a healthy dose of encouragement from myself and other leaders across the college) for your involvement in the very important work of implementing our plan and its deliverables. The implementation of our college strategic plan will be decentralized in nature, with broad participation and support an absolute necessity. We will be sharing information about the planning process through: high level information targeted primarily to external audiences on our website through a CoM Strategic Plan page, more detailed internal information and content to come later, and likely through further blogs, as well as various reminders, dates and news through our internal, weekly E-News. I’ll close by reiterating how much I hope for your involvement and input in, and support of, the planning process I’ve outlined here. Working together now to shape the next five years in the history of the CoM will be well worth the effort!